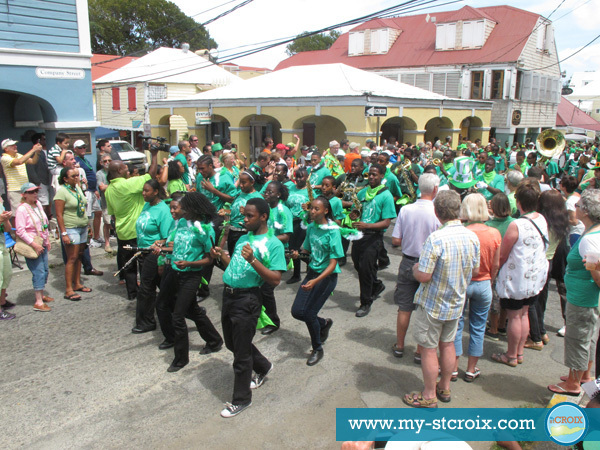 Each year on the Saturday closest to St Patrick’s Day, Christiansted goes green as revelers flood the streets clad in t-shirts and costumes while cheering on the Annual St Patrick’s Parade. With the Irish diaspora representing over 100 million people, the raucous holiday is celebrated more outside of Ireland than within. And here on St Croix, it’s done with true Crucian gusto, though many don’t realize the strong Irish heritage that St Croix has. 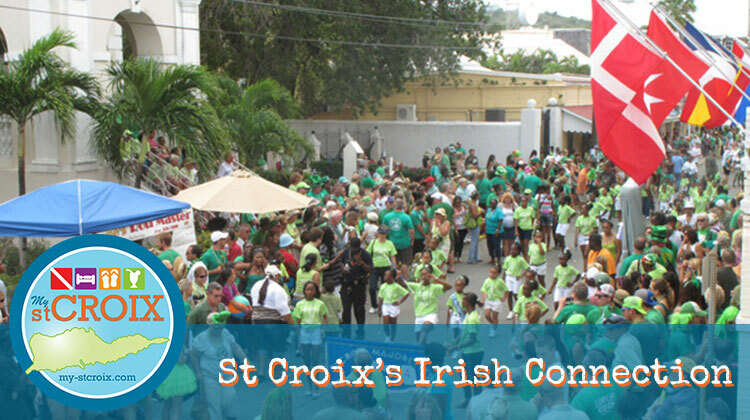 The St Croix St Patrick’s Day Parade got it’s official start in 1969 when a group of local business men got together on March 17th and started to talk about local celebrations. They wondered why an island that celebrates at any excuse, didn’t have an official St Paddy’s celebration. So, they took matters into their own hands, got a flatbed and a piano and drove through the streets of Christiansted singing Irish and local songs. Today, that tradition has grown into the annual parade and after-party featuring bands on floating stages and throughout the town. During the parade, local majorette troupes, high school bands and carnival troupes tramp through the streets celebrating their Irish Caribbean Heritage on an island full of Armstrongs, O’Bryans, O’Neales, O’Reillys and more. St Croix is proud of its diverse heritage that comes as a result of having flown the 7 flags of 6 different nations and the Knight’s of Malta since Columbus first landed in 1493. Though the Irish flag was not one of those, the island’s strong Irish connection is clear. It began alongside the Caribbean’s dark past and history with the rise of the sugar trade in the 1700’s. Along with other European nations in the eighteenth century, Ireland’s wealthy merchants got even wealthier with the trans-Atlantic slave trade. While not as successful in colonizing as the English, French, Spanish, and Dutch, they were the vast majority on the island of Montserrat with a strong presence on neighboring Antigua and Nevis that began in the 1600’s. There, merchants established plantations worked by both African slave labor and indentured farmers from Ireland. 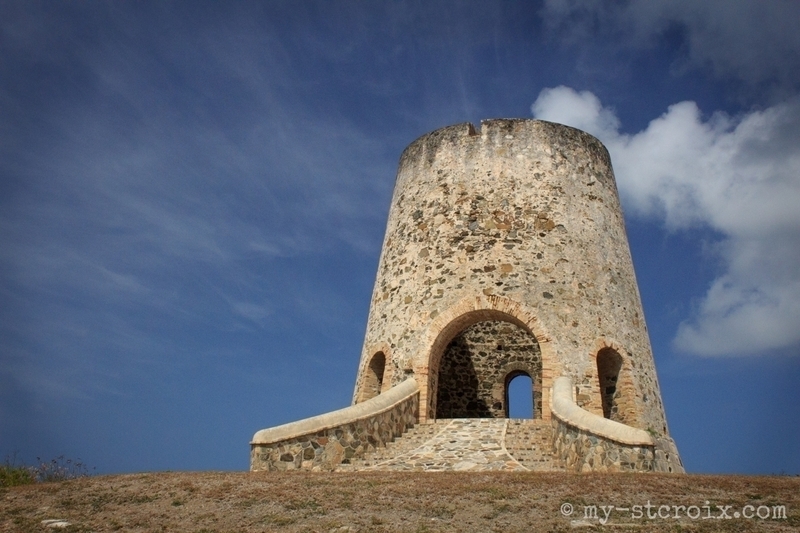 St Croix’s importance to the sugar trade can be seen by the many Sugar Mills that dot her landscape to this day. Find more St Croix Images. In 1733, the Danish West India company purchased the island of St Croix and began to develop their colony. The Danes had the money and mercantile expertise, but lacked the experience and manpower needed to develop sugar plantations on the fertile island. So, they recruited Irish Montserratians and laborers directly from Ireland to move to the new Danish colony on St Croix. One of those Irish Montserratians was Nicholas Tuite who eventually owned 7 Crucian plantations and was part owner of 7 more. In the height of the sugar craze in the West Indies, St Croix was dotted with over 150 Sugar Plantations and was booming. “In 1760 [Tuite] journeyed to Copenhagen, where Fredrick V appointed him chamberlain and paid tribute to his role as founder of Denmark’s Caribbean empire. … slave-trading and plantation-owning had made him the friend of kings.” – History Ireland: The Irish and the Atlantic slave trade. While there were a few wealthy Irish plantation owners like Tuite, most of the Irish who initially populated the Danish colony on St Croix were laborers. And while many of the West Indians who today bear the Irish surnames of the former slave owners, many also have shared heritage from the Irish laborers who became a part of the eclectic cultural fabric of the island and had intermarried with those of African descent. 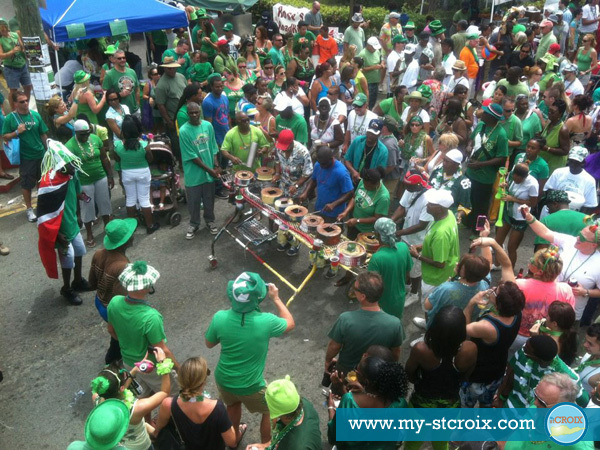 And that brings us to the beautifully diversity of the St Patrick’s Day parade on St Croix. If you haven’t yet been and won’t make it this year, be sure to make plans for next year. Slainte!